With the non-conference behind us, it's time to take stock of the Big Ten. Although the overall on-paper story is that the Big Ten is roughly as good (more accurately, mediocre) as it was last season. But almost all of that improvement is coming from the bottom of conference. While it's great that Rutgers and Minnesota have improved tremendously from the embarrassing showings last season, these are not likely to matter on Selection Sunday all that much (or are they—see below for comments on Minnesota). But there's no denying that the top of the conference is not as strong as it was last year, and that's not a great starting point, either, as just two teams made it to the second weekend of the NCAA Tournament (neither winning their Sweet 16 matchup). 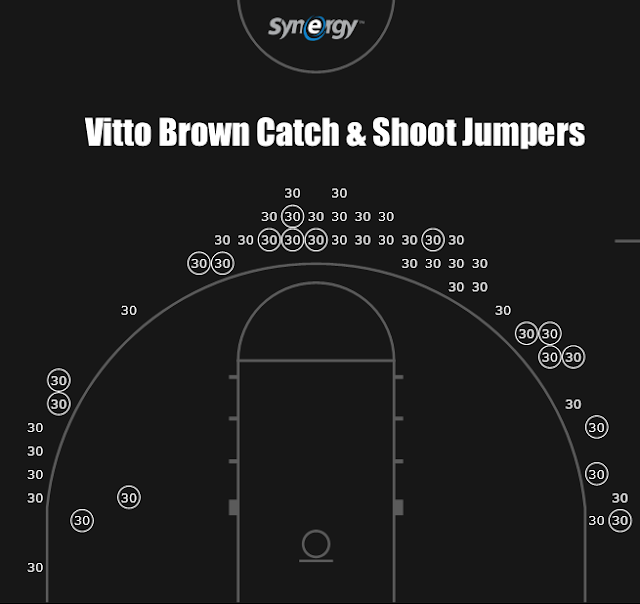 Last season, roughly at about this time of year, Vitto Brown extended his range by about 1 or 2 feet, and that brought massive benefits to the Badgers. From November through January, Brown was 10/37 (27%) on three-pointers. From February through the end of the season, he was 28/58 (48%). This year, Brown is shooting a nice-but-not great 34% on 3s, albeit on a much modified diet. Last season, Brown attempted about twice as many 2s as 3s, and this season he's effectively flipped that. Is that too much? Is his percentage just leveling off to his normal level of performance? Whatever the case, Wisconsin's offense has been struggling from shooting, with Brown, Nigel Hayes, and Bronson Koenig all hovering around the 35% mark. Hayes' shooting is pretty good considering his increased shot volume from his 40% mark as a sophomore. Koenig's shooting likely can also be explained by his extremely high workload (30% of the shots while he's on the floor). In Wisconsin's triangle/swing offense, these shots should be open all season. Greg Gard is hoping Vitto can start knocking a few more down. For what seems like the entirety of Matt Painter's tenure at Purdue, the winning formula has been to surround a 7-foot shotblocking dunkasaurus with a bevy of guards that pester defenses and run off screens mostly in an effort to prevent defenses from sitting in the paint to nullify said dunkasaurus. But that's not really the case this year. Instead, what we have is a team that is capable of putting 5 guys on the floor, each of whom can shoot 40% or better on 3s. Or, they can swap one of those players out for a possession-consuming low turnover guard, or an efficient combo forward currently shooting 65% on 2s. And both of those lineups do not want for muscle int he paint, because both include Caleb Swanigan, who is having a monster season (enjoy him while you can, Boiler fans). Biggie is making over 60 percent of his 2s, over 50 percent of his 3s, getting to the line, making his free throws (76%), creating for teammates, and rebounding at an extremely high level. Oh, but Purdue also has this 7-2, 290 lbs manbeast they can't figure out how to use. It was telling that, when down by 14 at the half to Notre Dame, Purdue rallied with Haas glued to the bench. The Irish boast one regular taller than 6-8, and he's a foul machine. Surely, Haas should have been able to dominate that game. But Haas has largely disappeared in Purdue's premier games this season. Against Louisville, Notre Dame, and Villanova, Haas has managed just 44 percent shooting on 2s (and really, it's just the first two of those—Haas was 8/10 against Nova). Let's look at some film, shall we? This possession ended well, but look at the Haas screen, and roll action. Haas is almost always going to either look to screen and roll to the hoop, or (if his man overplays the ballhandler) slip to the rim. Here, he rolls. But because of what Swanigan is cooking on the other side of the floor, the help defense is already there. Now, frankly, Mathias should be looking for his own shot when the defense goes under the screen like this, but I digress. The point is that Purdue is frequently in motion, meaning when something is developing on one side of the floor, the other side could be doing its own, independent thing. This is motion offense, dating all the way back to Bobby Knight. It's not as en vogue as it used to be, but Purdue is one of the remaining teams that run it (though they are slowly transitioning to more Pick and Roll sets as well). Here, we have Haas getting a relatively good look. He should hit this shot, sure. But he also seems to be rushing things, potentially because he's trying to beat a double team. No double team is coming however, though Swanigan does bring his man into Haas' airspace which does offer at least the appearance of help defense. Now, Haas should slow down, and Purdue's probably better off by trying to get open on the perimeter, rather than cutting into Haas' move. This is probably the biggest problem. Maybe it's because Haas is so much bigger, maybe it's because Purdue has so many weapons around him, or maybe it's just a lack of awareness, but Haas settles for plenty of bad shots. Here, early in the shot clock, Haas has lousy position that he doesn't attempt to make any better. His bodyweight gives away the move entirely, and he's able to get it off because the man guarding him is 9 inches shorter. Still, we're talking about a contested one-handed shot from about 13 feet. Surely, Purdue and Haas can do better. The thing is, Haas is better than all but a few starting centers in Division I. But for a variety of reasons—some the fault of his teammates, himself, and/or his offense—Purdue is having a hard time figuring out how to use him. Once again, Maryland is winning close games, but I'll continue to beat the drum this is an indication that some close losses are likely ahead, rather than indicative of a repeatable skill. Table that fight for now—overall, the Terrapins could still use some help for Melo Trimble. So far in the season, the supporting cast has been the surprisingly good play of freshmen. And that's good news for the Melo-less future, but I have my doubts that those contributions will be enough to drive UMD to a Tournament berth this season. Consider the case of Anthony Cowan. Cowan was a solid recruit, but he wasn't a decorated McDonald's All-American. But surprises happen sometimes, maybe Cowan is one. Well, if he were, ideally he'd be getting his points by less suspect means. Consider the fact that a 6-0 point guard is hitting 55 percent of his 2s. Were he to stay there all season, he'd be quite an outlier. Or, the fact that Cowan has the highest free throw rate of any player that's been on the floor for at least 60 percent of the available minutes. It's an outlandish amount of free throws he's attempted (74 against 42 two-point attempts), and while he's got a great mentor for that sort of thing, it's hard to see how he can maintain that level at his current usage. Damonte Dodd: currently working back from injury, Dodd has 14 turnovers against 11 made baskets. LG Gill: The transfer from Duquesne was touted as an inside-out player with versatility. So far, he's attempted 27 two-pointers (making just 7), and is 1/2 from 3. I don't know whether Gill can play at this level or not—the early returns are not good—but if he's going to compete at this level, I suspect it won't be because he completely changed the type of player he is. Northwestern has put together an impressive non-conference with only a couple of very close losses to quality teams. Still, you don't have to look very hard for structural weaknesses. In particular, the Wildcats are very thin in the paint. Some of that is due to Dererk Pardon's injury, but while Pardon has shown flashes, he has yet to put it all together. 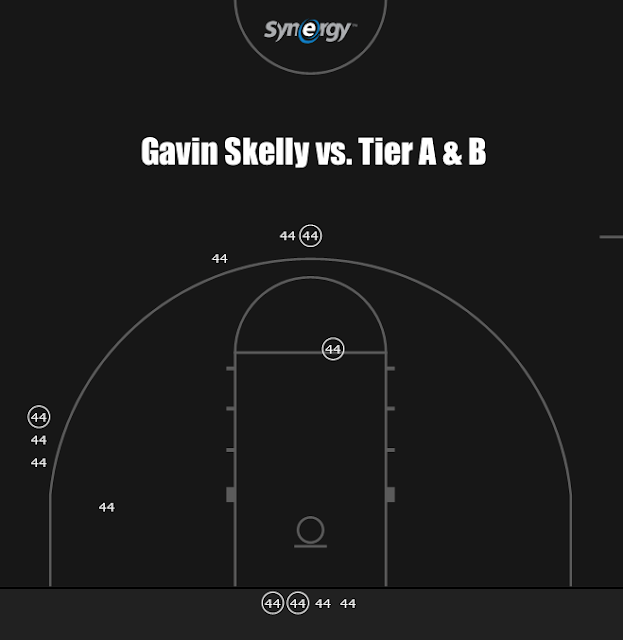 At first glance, junior Gavin Skelly is having a breakout season. What's not to like—he's shooting 35% on 3s, 70% on 2s, he's blocking shots, getting to the line, and even setting up teammates. Well, the biggest problem with Skelly is that he's an epic bumslayer. The Cats have played four Tier A&B teams this year (Butler, Wake Forest, Texas, and Notre Dame). Against those opponents, Skelly has made 5 of 15 shots, and he's paired that with 8 turnovers. Against everyone else, he's 33/48 with just 6 turnovers. Of course, the Big Ten looks more like Wake Forest (how about Danny Manning? ), on average, than it does Bryant University. Most of these are jumpshots, and everything is either centered with the hoop, or toward his dominant hand. But, he did get 4 opportunities at the rim. Let's take a look, shall we? Here, Skelly slips the screen as Dayton is exerting pressure to try and get back into the game. The look is open, but Skelly is swallowed up by the Flyers. Next up is Skelly driving to the lane after popping from a screen. It's good recognition, and a good take, though it's helped out by poor defense from Wake (the defender half-guards Skelly and Lumpkin) and the fact Wake does not want to leave Scottie Lindsey open from 3 (for good reason). Then we see the exact same action, only this time from the left side. Skelly's handle is not good here, but it doesn't matter because Wake Forest gives way too much respect to Sanjay Lumpkin's shooting ability. He's improved, but he's still someone you can help off of, particularly to stop a layup. Finally, we have Skelly getting his shot blocked hard enough to leave a mark on the backboard. Truthfully, this is his most impressive play in the sequence, as he makes a great read and forces the defense to sell out on him. He didn't have enough room to pass out of it, so I don't have a problem with this shot. Frankly, a fake pass to Skelly and hitting Lumpkin in the corner would have been a great play. Skelly didn't do a poor job on any of these plays, but the type of shots here are enlightening. All are opportunities created off a ball screen, where Skelly is getting a head of steam before he gets into the paint. He's not going to win back-to-the-basket battles in the Big Ten, he's just not that type of player. So that leaves Pardon and Benson as the big men that can score tough buckets in the paint. If neither are up to it, there's going to be a lot of pressure on NU's guards to hit 3s to spread defenses out. ** Penn State is one of the youngest teams in all of Division I, so it's expected that the Nittany Lions will struggle this season. Still, considering how young this team is, it's going relatively well. Freshmen Tony Carr, Lamar Stevens, and Mike Watkins provide a great foundation for Pat Chambers to build on, and also provide plenty of optimism for next season and beyond. If he's not at the rim or on the block, he's probably not going to shoot the ball. Despite that limitation in his shot selection, Watkins does manage to carry an above-average usage while he's on the court. That's a big boost for a team that's heavy on quick wings and guards, but light on capable big men who can convert at the rim. Watkins isn't especially skilled at generating his offense via post-up moves. Per Synergy Sports, he converts those opportunities into points at a 0.73 points per possession rate. But around the basket, where he's not posting up (excluding transition opportunities), Watkins is getting over 1.5 points per possession. It's not a complicated strategy—be ready to receive passes around the hoop, aggressively hit the glass, and try to dunk everything. 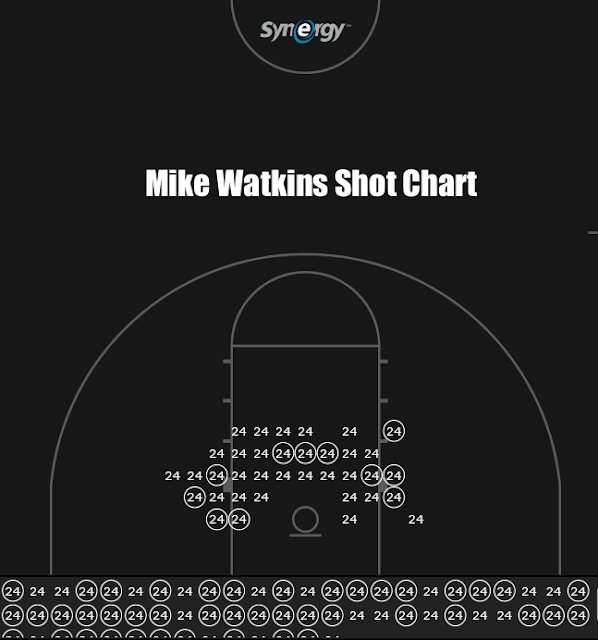 Whenever you hear fans complain about a lack of a frontcourt presence, they're really just complaining about not having a guy like Mike Watkins. The only problem Penn State has with Watkins is that they have just one of him. His backup minutes are largely consumed by Julian Moore, who has converted just 34 percent of his 2-point attempts despite his 6-10 frame. Even more problematic is the fact that outside Watkins and guard Josh Reaves, no one else on the team is shooting over 50 percent on 2s. Collectively, that has made Penn State one of the worst two-point shooting teams in the country, which is the principal reason why the offense has strugged. Against George Mason, who allotted all of 19 minutes out of a possible 200 to players standing taller than 6-7, the Nittany Lions managed a pathetic 36 percent from 2. Even recognizing this is a team built for winning after this season, Chambers will need to add to his frontcourt in order to get the Lions back to the NCAA Tournament. This isn't a rigid formula, mind you. Some Spartan teams weren't especially deep (2011). Some weren't great on the glass (2004). Some were actually OK at taking care of the ball (2015). But these teams all compensated for these things by excelling somewhere else. The 2014 version of Michigan State was a perimeter-oriented team that started 5 players who attempted and made three-pointers at a high rate. The 2012 team was a defensive force led by Draymond Green, Branden Dawson, and Adreian Payne. This year's Michigan State team is on track to be the worst Izzo has coached since the Flintstones arrived. And it's hard for one to put your finger on what this team is about. If anything, it's shooting 3s, which it does well enough, but I hesitate to put all the eggs in that particular basket with turnovers as bad as they've ever been. Clearly, while this team can shoot 3s at a respectable level, they can't figure out how to reap the other benefits of playing on the perimeter. Part of the reason might be the insistence on depth. Far be it for me to tell Izzo how to coach...but I'm going to do it anyways. Consider the fact that, per kenpom, over the past 5 games Izzo has deployed a lineup consisting of both Lourwals Nairn and Kenny Goings more than any other lineup combination. Each player is extremely low-usage, combining to consume fewer possessions than just one Elon Harris. By placing both Nairn and Goins on the floor at the same time, Izzo is forcing the other 3 players on the floor to be go-to scorers. Eron Harris is the only willing scorer in that group. Based on season averages of the other four in that lineup, Harris would be expected to consume a whopping 43.2 percent of MSU's possessions. Before one throws stones at Harris' performance thus far this season, consider the burdens that have been placed upon him. There's too much talent on the roster for this team to be this bad. Miles Bridges should be back any day now, Nick Ward looks like a steal (why he's getting the smaller end of a timeshare with Goins, I've no idea), and Cassius Winston is already a top-level point guard. This team is good enough to win, it's just not good enough to win how they're trying to, right now.